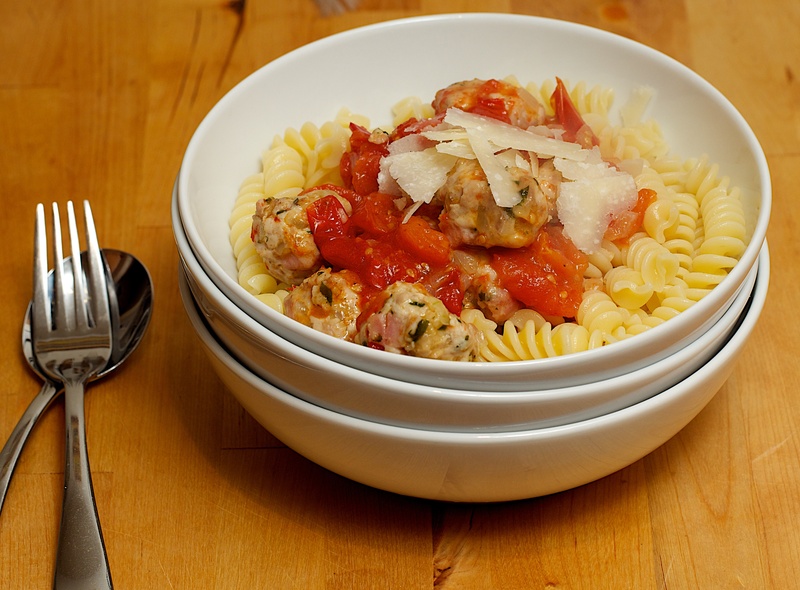 We found these to be a surprisingly tasty alternative to traditional spaghetti and meatballs. We loved these for their freshness and verve; it really hit the spot for a weeknight dinner. It was also usefully quick and easy as well as being very cost effective. Wine Suggestion: try some of Italy’s thoroughly modern whites that are being rejuvenated and reinvented. If you can find a good Pecorino from the Marche you’ll be in for a treat. We had a glass of Umani Ronchi’s Vellodoro which had good freshness of fruit and terrific depth of minerality and nutty savouriness; showing what can be done with a forgotten grape variety when love and attention are given. Preheat the oven to 200ºC/400ºF/Gas 6. Heat 1 tbsp of the oil in a saucepan over medium-high heat. Add the onion and garlic and cook for 5 minutes, or until softened. Add the coriander and chilli and cook for another minute. Put the chicken in a bowl with the breadcrumbs, pancetta, parsley and some salt. Add the spiced onion and mix well with your hands. Refrigerate for 30 minutes, then wet your hands with cold water and roll the mixture into small meatballs. Put the cherry tomatoes on a baking tray lined with baking paper, drizzle with 1 tbsp olive oil and season. Put the meatballs on another lined tray and drizzle with the remaining oil. Roast the tomatoes and meatballs for 15-20 minute, or until the meatballs are golden and the tomatoes are starting to burst. Put the stock and tomatoes in a saucepan and add the meatballs. Simmer for 5 minutes and season. Serve with the cooked pasta and some Parmesan shavings.